Keep your dog safe while you’re away and house train him quickly and effectively with a Paws & Pals Double-Door Folding Heavy-Duty Wire Dog Crate. 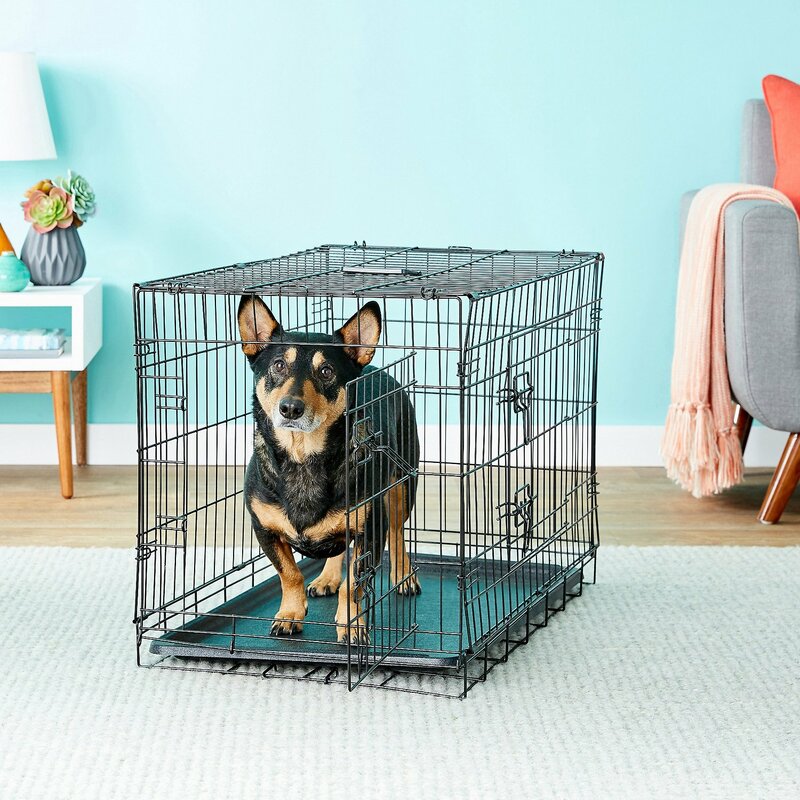 In nature, canines feel safe and secure in their den, and a crate of his own to call home can give your pooch the same level of comfort, regardless of his age. It’s made of high tensile-strength, steel wire that’s securely formed and welded for strength and durability and then electro-coated for rust, corrosion and fade resistance, even in extreme climates. The collapsible design makes it simple to set up in seconds and a cinch to fold and store, whenever needed. It’s also ideal for taking along on a road trip to keep him safe and comfortable in a hotel, friend’s home or other unfamiliar location. 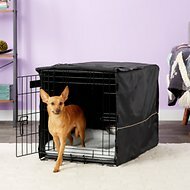 Keep your dog secure and house-train him quickly and effectively; removable divider panel allows you to adjust the size of his living space as he grows. A comfortable crate reinforces your canine’s natural denning instinct and provides a place for him to feel safe. High tensile-strength, steel wire is formed and welded for strength and durability, and then electro-coated for rust, corrosion and fade resistance. Collapsible design is simple to set up and a cinch to fold and store; sturdy ABS plastic tray is lipped to help contain accidents and slides out for easy cleaning. Also ideal for bringing along your pup on a road trip to keep him safe and comfortable in unfamiliar locations. Make sure to check out the size chart to ensure you get the correct size crate for your pet. Also available as a 20-inch Single-Door Crate. Clean routinely with a mild, non-toxic cleaner and water. Using this kennel with the side door seemed to prevent dog induced destruction/bending. The locking mechanism is a bit finicky on the side. When I moved the kennel yesterday where I needed to open it on the side my 25 lb corgidor bent the kennel and popped the tray halfway out. She continues to bend it in more, since it bends so easily, I’m not sure how long this kennel will last us. I will need to find another location to reposition the crate so the side door is against a wall to prevent her from bending the kennel further. 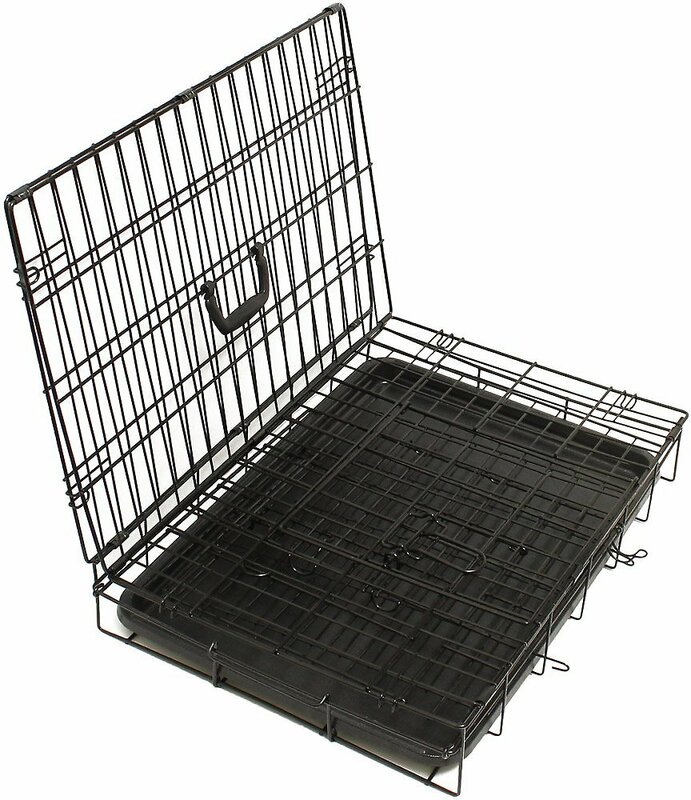 I bought the 36 inch crate with 2 doors for our 2 year old 12 pound chiweenie that is very long. It was easy to setup. On day 2 of using the crate our dog was able to bend the side door to the inside of the crate. The metal can bend very easy. We had an extra small divider from a smaller crate we have and my husband attached it to the side door to make it stronger. On the end door we ended up putting 2 very small locks on it so it cannot be pulled inside of the crate. The pictures make it look like heavy metal crate but it is not. The locks are also very hard to lock. This crate was rather hard to assemble. The door latches did not line up well and took a little bit of adjusting to work correctly. Also, the box said a training manual was included but there was no manual in the box, nor were there any instructions on how to assemble the crate. However, once assembled, it is the perfect size and we love it! I would definitely recommend this product but be prepared to have a little patience in getting it set up. Overall the crate was as I expected. My one complaint is the door latch isn't well designed and doesn't operate smoothly. I have another very similar crate (different brand) and that latch works perfectly. This one doesn't line up well with the other side and you have to get it at just the right angle to make it slide. Heavy Duty and Easy Setup! I bought this kennel for times when I need to contain one of my 3 cats. I purchased the faux fleece kennel liner to go in it and it is REALLY nice! It sets up easily and doesn't take up a lot if space. I've kept it up as an extra sleeping area because it is ideal for napping, too. The metal isn’t as thick as our old kennel but are dog isn’t trying to get out so it is okay. If you have a dog that would try to get out it is a bit flimsy. The door latch doesn’t close easily so that is also a pain. It does its job, but is low end. It is what I expected and will serve the purpose. However, I expected it to be 30 X 30. Guess I didn't read the fine print, huh? We needed it for our 16 lb Yorkie who had surgery and had to wear an Elizabethan collar. It was hard for him to turn around without bumping the collar. That's the only drawback. Was totally shocked at how heavy duty this crate is, for the low price!! If I could give more stars, I would. This same crate at my local department store, which has very low prices on merchandise, was $10 more!! I highly recommend buying any crate you may need, from Chewy!! You won't be disappointed!